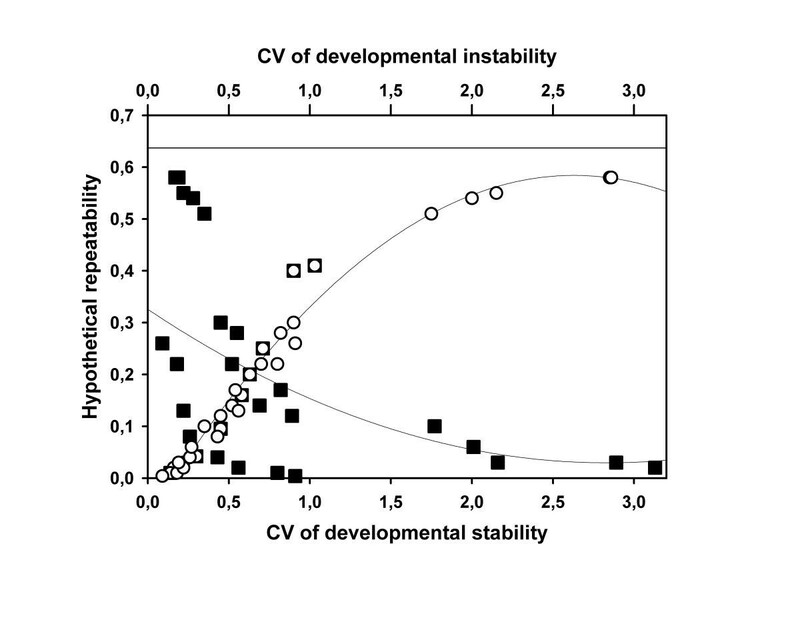 We are considering developmental stability – i.e. 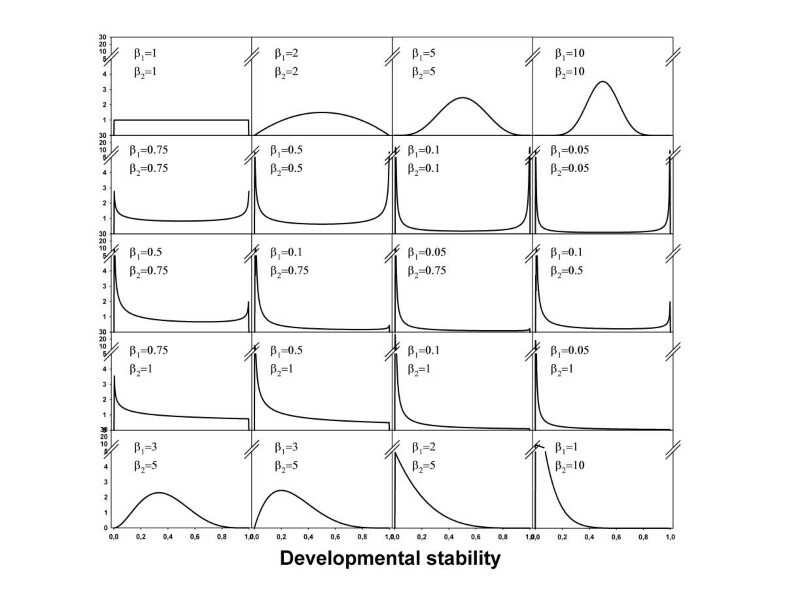 the individual buffering capacity – as the biologically relevant trait and show that (i) little variation in developmental stability can explain observed variation in fluctuating asymmetry when the distribution of developmental stability is highly skewed, and (ii) that a previously developed tool (i.e. 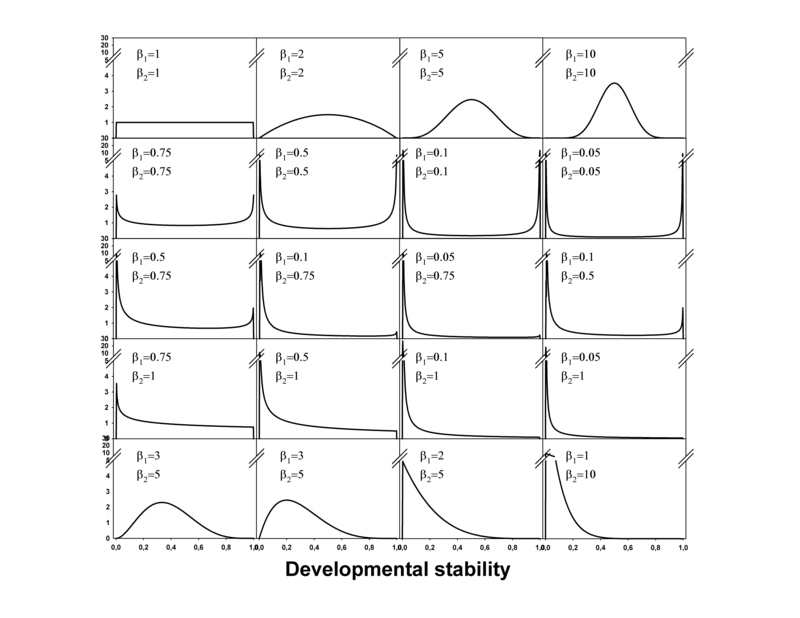 the hypothetical repeatability of fluctuating asymmetry) contains only limited information about variation in developmental stability, which stands in sharp contrast to the earlier established close association between the repeatability and developmental instability. We provide tools to generate valuable information about the distribution of between-individual variation in developmental stability. A simple linear transformation of a previous model lead to completely different conclusions. Thus, theoretical modelling of asymmetry and stability appears to be very sensitive to the scale of inference. More research is urgently needed to get better insights in the developmental mechanisms of noise and stability. In spite of the fact that the model is likely to represent an oversimplification of reality, the accumulation of new insights could be incorporated in the Bayesian statistical approach to obtain more reliable estimation. As a consequence of the stochastic nature of cellular processes, the development of any trait is disturbed by the accumulation of small random errors. This developmental noise (DN) may be counteracted by individual-specific buffering mechanisms that ensure a controlled development [i.e. Development stability (DS)] . DS is not directly observable from the trait values but can presumably be measured by small random deviations from perfect symmetry of bilateral traits [i.e. Fluctuating asymmetry (FA)]. The underlying idea is that left and right sides of a bilaterally symmetric trait are under the control of the same set of genes and experience similar environmental conditions. Ideally, both sides should follow exactly the same developmental pathways leading to a perfectly symmetric morphology. Any deviation from symmetry is assumed to reflect failure to buffer development against random noise. FA has been studies intensively in the area of evolutionary biology and conservation because FA could act as a general measure of the adverse fitness effects of environmental and/or genetic stress . It is often postulated that all individuals experience noise during development irrespective of the levels of stress they experience. While controlled growth should be able to correct for these perturbations under ideal developmental conditions. Yet, under levels of stress, insufficient amounts of energy remain available to assure controlled stable development. The relationship between DS and FA on the one hand, and stress and fitness on the other hand, together with their genetic background has been the subject of many debates in the evolutionary literature. Many, but certainly not all, studies show a positive relationship between FA and stress at the individual and population level. These observations have led to the assumption that the unobservable DS decreases with environmental and/or genetic stress, and that DS may express individual (genetic) quality and population health . Yet, because of many caveats in the literature, the generality of these associations has been questioned [3, 4]. The most appealing feature of FA as potential estimator of stress and fitness is that a biologically complex and poorly understood property (i.e. DS) can be estimated by simply measuring both sides of a bilaterally symmetric trait. In sharp contrast to this seeming lucidity stand statistical complexity, difficulties in interpretation and lack of a mechanistic approach [1, 5]. If we restrict our arguments to FA only – and neglect directional asymmetry and antisymmetry of which the link with DS is subject of many debates as well [1, 6, 7] – the controversy is the result of two phenomena. Firstly, levels of asymmetry are often small and measurement error biases FA-estimates upward. Repeated measurements on each side and mixed-model analysis yield unbiased estimates [8, 9]. Secondly, DS and DN cannot be observed directly and independently, and very little is known about the developmental mechanisms that lead to asymmetric trait expression (although progresses in this field have been made that ). Based on statistical arguments the association between individual asymmetry and DS is presumed to be weak [10–15]. Consequently, associations between FA and other factors underestimate the degree of association with DS. Yet, model assumptions have been challenged for both mechanistic  and statistical  reasons. Whitlock  and Houle  have initiated the development of models that establish a link between FA and DS based on the normal assumption of DN. Yet, the terminology of the literature has been confusing. DS, developmental noise, developmental imprecision, developmental precision and developmental instability have been used interchangeably, sometimes to indicate the same process while they mean different things. Here we use DN to indicate the random process that causes a developing trait to deviate from its expected growth trajectory (given its genotype and environmental conditions). DS is the buffering capacity counteracting DN. The resulting developmental imprecision or developmental instability (DI) is the result of the joint action of DN and DS. Thus, FA relates positively to DN and DI and negatively to DS. Most importantly it should be noted that DS is the biological property of interest in this context since it refers to the feature of the individual. The underlying assumption of the models that link FA and DS, is that DI is expressed as a variance where individual asymmetry can be regarded as a sample from a normal distribution with zero mean and variance equal to 2×DI . Therefore, variation in asymmetry may be large in spite of little or no variation in DI [10, 11, 16], resulting in a downward bias of patterns in FA [10, 12]. This downward bias can be corrected for in two different ways. Associations between FA and other factors and heritabilities can be transformed using the so-called hypothetical repeatability (i.e. R, the proportion of variation in FA that is due to variation in the underlying DI [10, 11, 14, 15]). Or – making use of a latent variable model in a Bayesian context – estimates of slopes and heritabilities can be obtained directly, taking all sources of uncertainty into account . The importance of the downward bias for heritabilities in DI, between-trait correlations and the association between DI and fitness was evaluated twice in the recent literature [15, 16]. Both papers reached different conclusions. Based on data from several large datasets, Gangestad and Thornhill  concluded that values of R are often small (+ 0.04). They subsequently concluded that a low heritability of FA or a weak FA-fitness association could still be the result of a much stronger effect in DI. Van Dongen and Lens  on the other hand concluded that values of R may be much higher in some cases, but observed that even in those cases heritabilities of DI remain low. Houle  indirectly challenged the latter conclusion. His analytical and numerical results showed that in order to obtain high values of R, coefficients of variation (CV) in DI should be unrealistically high (>100%) relative to morphological traits (CV typically between 2 and 20%) and fitness components (CV typically between 10 and 100%). Therefore, model assumptions may be incorrect . In this paper we propose an alternative model which is a simple linear transformation of the previous one. Current models consider variation at the level of DI, the joint action of DN and DS [10–15, 17]. Yet, DS is the individual-specific trait of interest that is presumably related with stress and fitness. We therefore treat individual DS as the proportion by which DN is reduced resulting in an individual-specific value of DI. Our numerical simulations indicate that only small amounts of variation in DS are required to obtain high values of R. In addition, the relationship between variation in DS and R depends on the shape of the distribution of between-individual variation in DS. Thus, there is no simple and direct relationship between the amount of variation in DS and R. Nevertheless, the common feature of both models is the high skewness in the distributions of either DI  or DS (below). In a final section, a statistical framework is proposed that provides estimates of this distribution of DS. We apply the method to both simulated and real data. where DS ∈ [0,1[ and large values of DS indicate high buffering capacity. Note that 1 is not included in the domain of DS since this would lead to a zero variance. The model hereby assumes that perfect symmetry does not exist in nature . In this section the attributes of model (3) are investigated by simulating datasets under different conditions. A range of distributions of DS is evaluated and results are compared with earlier conclusions. Assume that the development of a particular trait of interest experiences the same amount of noise in each individual (i.e. DN constant), but that variation in DS exists. The beta-distribution is a good candidate distribution to model variation in DS because it is bounded between 0 and 1 and can take many different shapes. It is determined by two parameters β1 and β2 that can only take positive values. When both parameters exceed 1 the distribution is unimodal and when β1 equals β2 it is symmetric. When β1<β2 or β1>β2 the distribution is skewed to the right and the left respectively. When both β1 and β2 are smaller than 1 the distribution becomes bimodal. Distributions used here are represented graphically in Figure 1. For each parameter combination, 1000 samples of 10000 individuals were generated in WINBUGS (Version 1.3 freely available at http://www.mrc-bsu.cam.ac.uk/bugs), and the coefficients of variation in DS and DI as well as R were estimated. Mean values were calculated across the 1000 samples to keep stochastic variation minimal. The beta-distributions applied to model variation in DS generated a broad range of CV values for both DS and DI and of values of R (Table 1). In agreement with earlier results [13, 15], R was closely and positively associated with the CV of DI (Fig. 2). Values larger than 100% were required to obtain relative large values of R (>0.4). However, when examining the relationship at the level of DS, the association was negative (Fig. 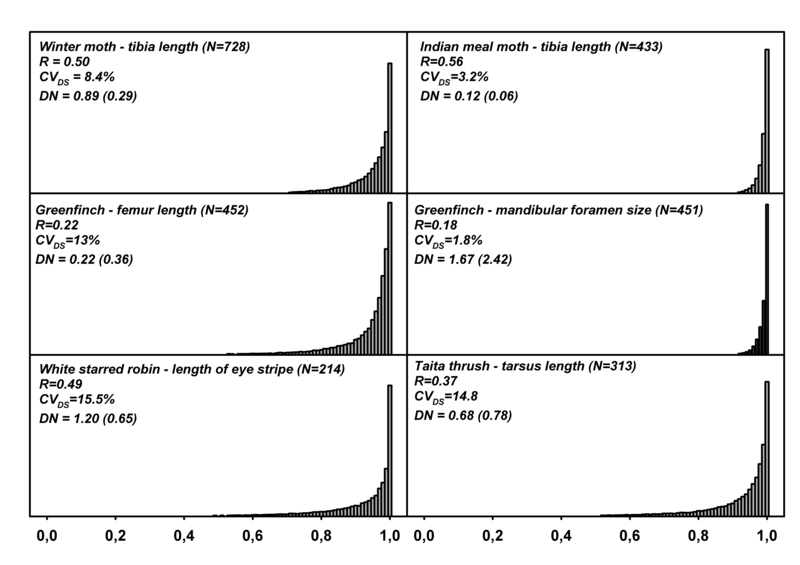 2) indicating that only small amounts of variation in DS were required to obtain large values of R. For example, the largest value of R was obtained with a left skewed distribution of DS with a values of CV equal to only 17% (Table 1), hereby lying well within the range of morphological and fitness traits . Results of numerical simulations Hypothetical repeatability of single trait unsigned asymmetry (R) and the coefficient of variation of DS (CV-DS) and instability (CV-DI) for simulated datasets were the distribution of DS followed a beta-distribution with different shapes (Fig.1). Results are means (SD) of 1000 samples of 10000 observations. When examining Table 1 and Figure 2 in more detail, the overall negative association between R and the CV of DS did not appear to hold when the distribution of DS was symmetrical. Values of the CV's of DS and DI were identical and in both cases correlated positively with R. Thus, the association between the CV's of DS and R depends on the shape of the distribution of between-individual variation in DS. In addition to the amount of variation, distributional characteristics of DS have an important impact on the relationship with values of R. As a result, values of R do not consistently reflect variation in DS and distributional characteristics of variation in DS need to be evaluated additionally. Below we first propose a statistical model based on Bayesian statistical principles, to estimate the distribution of DS and then apply it to both simulated and empirical data. The first step in any Bayesian analysis is to construct the full joint probability model of both the parameters of the model (a vector indicated by θ) and the data (indicated by y) as p(θ,y). This model can be decomposed in a set of sub-models, which are then completed with prior distributions [p(θ)]. In contrast to more traditional methods, parameters are considered to be stochastic rather than fixed. Conclusions about the parameter space θ are made in terms of probability statements conditional on the data y. These probability statements are based on the posterior distribution of each parameter [p(θ|y) = p(θ)p(y|θ)/p(y)] which can either be obtained analytically or by Monte Carlo Markov Chain simulation (MCMC) [19, 20]. where i = 1..N and j = 1..K with N = number of individuals and K = number of within subject repeats. The parameter estimates obtained from this model have exactly the same interpretation as for the empirical Bayes' approach . However, because each parameter is treated as a stochastic variable, standard deviations become slightly larger . The main importance of this part of the model is to obtain unbiased estimates of individual asymmetry, here treated as distributions instead of fixed values. Posterior distributions of the parameters of interest could in theory be obtained analytically, but in practice our model is to complex. Alternatively, simulation techniques provide a convenient option. The computer package WINBUGS applied here to analyse the different datasets, makes use of MCMC with Gibbs sampling and the Metropolis-Hastings algorithm [19, 20]. In each analysis performed below, 5 independent chains were run with a burn in period of 500 iterations and 1000 iterations from which the posterior distributions were estimated. Each distribution is thus based on 5000 iterations. Convergence was checked with the Gelman and Rubin 'shrink factor' in combination with visual inspection of the chains and their degree of autocorrelation [22, 23]. Unless mentioned otherwise, convergence behaviour was good. In order to evaluate the usefulness and limitations of the proposed technique, datasets with six different distributional characteristics of DS and three different sample sizes were generated and subsequently analysed. Posterior means and medians of DN are given in Table 2. These estimates appeared to be biased upward for the two left-skewed (β1>β2) distributions and the bimodal one. For the other shapes of the distribution of DS (see Fig. 3), estimates of DN were more accurate. This result is not unexpected. In left-skewed distributions relatively few individuals are developmentally unstable (i.e. low DS), while those individuals contain most information about the size of DN. Posterior mean (SD) and median values of the degree of developmental noise (DN). Data were generated for three different sample sizes and for six different shapes of the distribution of DS, as determined by two parameters β1 and β2 of the beta-distribution. The true underlying value of DN equalled 1. Estimated distributions of variation in DS are presented graphically in Figure 3. Figure 3 shows expected and estimated distributions of between individual variation in DS. In most occasions the estimated distribution, although sometimes roughly, approximated the expected distribution (Fig. 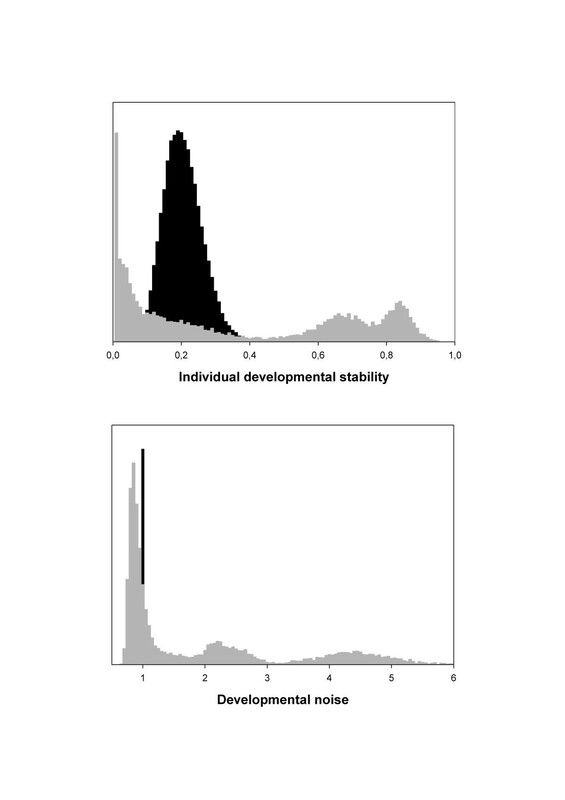 3), except for the bimodal case where the peak of developmentally unstable individuals was not detected (Fig. 3 bottom row). In general, and ignoring the bimodal case, the shape of the distribution was detected even so for sample sizes of 500 individuals. Still, in one occasion the MCMC failed to converge. Convergence problems occur even more frequently for smaller sample sizes (i.e. N = 250), but upon convergence the obtained estimate of the distribution reflected the true shape (data not shown). We treat DI as the joint effect of DN and DS (equation 3). Because the observable FA of a trait depends on the magnitude of DI, DN and DS can only be separated statistically from each other under particular conditions. That is when one of the two is held constant (in our simulations we keep DN constant) and when values of the other span the whole range of possible values (between 0 and 1 for DS). Suppose we limit the distribution of between-individual variation in DS between 0 and 0.5 and use a value of DN equal to 1. The variance component DI that leads to the observable FA values, then varies between 1 and 0.5. However, the same range can be obtained for, for example, a value of DN equal to 10 and DS ranging between 0.1 and 0.05. In other words, different solutions are equally likely. This is illustrated by the posterior distributions of DS and DN obtained for this particular example with a sample of 500 individuals (Fig. 4). 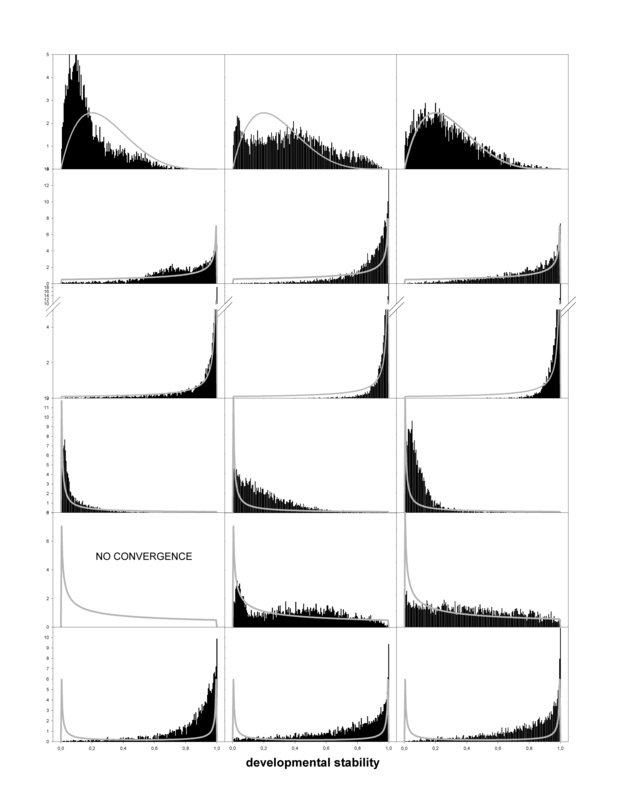 For both DS and DN multimodal distributions are obtained and the MCMC's did not show convergence. Together with problems of small sample sizes a restricted range of the distribution of DS appears to lead to convergence problems. Analyses of simulated data showed that the presented method provides reliable estimates of the distribution of DS under a variety of conditions. In addition, unless the MCMC failed to converge, the obtained distributions approximated the underlying ones. We therefore assume that convergence offers a good criterion for the reliability of obtained results. We apply the above model to 8 datasets from 5 different species and 7 different traits (Table 3), following the specifications detailed above. In two cases, the MCMC did not converge. The hypothetical repeatabilities in these cases were low (Table 3) and not significantly different from zero. Thus, the available data do not allow concluding that variation in individual DS was present. Distributions of between-individual variation in DS of the remaining six samples – which did show good convergence behaviour – are given in Figure 5. Distributions are remarkably similar in shape, all showing a highly left skewed distribution, irrespective of the value of the hypothetical repeatability. 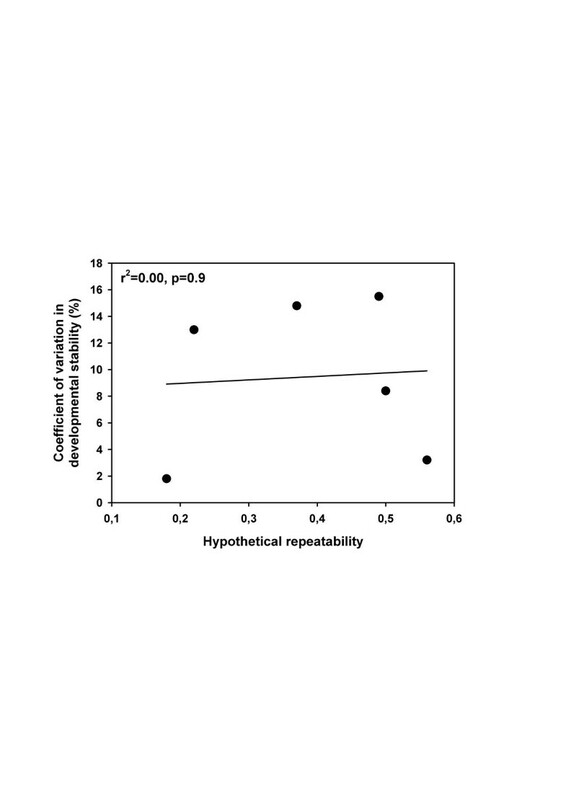 In addition, values of R were not correlated with the degree of variation in DS (Fig. 6). Overview of empirical datasets used to estimate developmental noise and the distribution of variation in DS simultaneously. The strength of the association between DS, DI and the observable degree of asymmetry has been the subject of intense debate in the recent literature [10–15]. In this paper we rescale the current model and treat DS – the presumed biologically relevant trait – as a proportion by which DN is reduced during development. This approach yields three important results. First, in contrast to DI, variation in DS does not need to be unrealistically high to explain observed distributional characteristics of FA. Second, in agreement with findings for DI, highly skewed distributions are required to generate high values of R, the so-called hypothetical repeatability of FA . Third, there appeared no single unique association between variation in DS and R. A method was developed that allows the estimation of DN and of variation in DS simultaneously. Analyses of different simulated datasets revealed that in general the shape characteristics of variation in DS are detected unless it is bimodal or convergence problems occurred. Using this Bayesian model to analyse different empirical datasets revealed that high skewness may be a general property of variation in DS for asymmetry data with both high and low values of R. In addition, values of R may not contain much information on the amount of variation in DS. Because relative little research has been conducted on the mechanisms of DN and DS, validation of these assumptions remains difficult and speculative. Recently, Klingenberg  reviewed studies that provide evidence for the existence of both DN and DS but emphasises the need for a specific experimental approach. Random variation in concentrations, delays in diffusion and stochastic switching of gene expression are all potential molecular mechanisms of DN but it is not clear if they vary among individuals and/or are affected by stress. Furthermore, mechanisms like gene duplication and stabilisation of proteins by chaperones (e.g. Heat shock proteins) could ensure DS but again the effects of stress are only poorly understood . Finally, the normal distribution of random noise and the independence between two developing traits has been challenged as well. Although the normal distribution appears to fit asymmetry data very well , non-linear developmental mapping – which appears to be very widespread  – would result in skewed distributions of trait values on left and right. This would in turn result in a leptokurtic distribution of asymmetry values, which appears to be widespread as well [13, 16]. Taken altogether, the model developed here is likely to be a serious oversimplification of reality where distributions of noise may be non-normal and non-additive and where between-individual variation in DN may exist next to variation in DS [1, 2]. However, Bayesian modelling has the desired flexibility to take (some of) these above features into account. When new experiments are being carried out and more insight is gained in the developmental biology of DN and DS, other distributional characteristics and correlations could be incorporated to yield more realistic results. Until then the normal and independent model could be viewed as a convenient approximation of the real phenomena . Both authors hold a Postdoctoral fellowship with the Science Fund Flanders (FWO Vlaanderen). We thank Eevi Karvonen, Juha Merilä and Pekka Rintamäki for making the greenfinch data available for analysis. SVD performed the simulations and statistical analyses and drafted the manuscript. LL is leading scientist of the Kenyan bird studies and drafted the manuscript.